Job: Manages shipping production for start-up company Arecont Vision that supplies security cameras. Children in LAUSD: Three stepdaughters who are triplets: one at Granada Hills Charter High School, one at Kennedy High School in Granada Hills, one in a non-public special ed school in Glendale; two grown children who attended LAUSD schools. LAUSD student? : No, he attended high school in New York state. Lives: Recently moved to East Los Angeles. Platform: Hold charter schools accountable, represent board as a parent and make special education more equitable for those who need it. 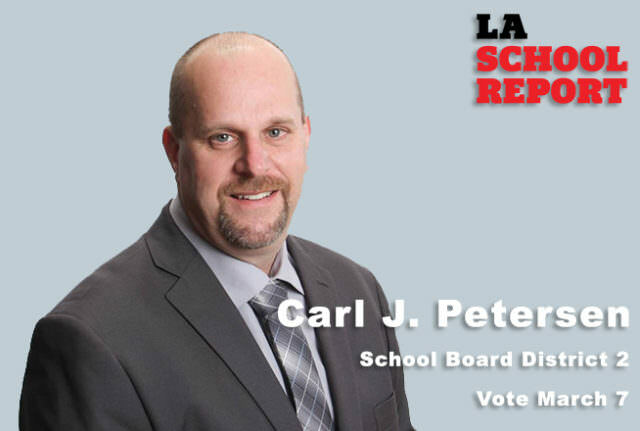 Anyone who regularly attends LA Unified school board meetings will be familiar with Carl J. Petersen, who frequently addresses the board, and often is critical of what they are doing. 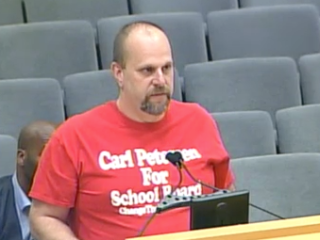 Lately, he has been wearing one of his many “Carl Petersen for School Board” T-shirts. Petersen, 49, ran against Tamar Galatzan as one of five candidates in the San Fernando Valley that forced her into a run-off, and then he threw his support for Scott Schmerelson who defeated her. This time, he is running against Mónica García in District 2 in Boyle Heights and East Los Angeles. He is renting a room in the district and said his wife, Nicole, and three daughters will soon follow. School teacher Lisa Alva is also running for the seat. So far, Petersen has raised more money than he did the whole campaign last time he sought office. He said he knows his grassroots campaign has a tough uphill battle. Two of his triplet daughters are on the autism spectrum so Petersen said he is passionate about equitable education for students with special needs. He writes regularly on his own blog, ChangeTheLAUSD.com and has been endorsed by writer Diane Ravitch’s group Network for Public Education Action. Below is an extensive interview conducted with the candidate, edited for length and clarity. 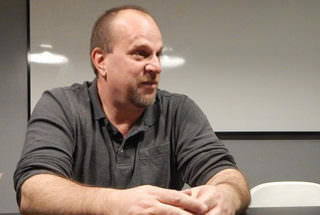 Carl Petersen is running for school board, District 2. Q: What made you want to run for this particular district? A: I was considering a run because of Mónica García’s record for supporting charter schools. As you know, I ran in District 3 against Tamar Galatzan with the same philosophy. So, it didn’t look like anyone was going to run against (García) and I thought that she should be opposed so at least there is a discussion. Q: So what made your final decision? A: When I was still trying to decide, I was at a board meeting and out of the blue she said, “When we say $1.4 billion for special ed and we only have $700 million from the federal government and the other $700 million are coming from every child in this district, I’m not about defunding special ed. I just know that we have a serious issue to how can we serve our own kids?” And as a dad with two children with special needs daughters, my face went red, and I decided I was going to run. Q: What made you so angry? A: She mentioned the cost of the special education centers. It’s as if she wanted to push special education kids into the classroom, and certain kids need a separated classroom. Q: So are you against charter schools? A: I’m for making sure they’re held accountable. I think they should be held to the same rules as other schools. Q: I know that you’ve spoken out against them. A: Only in the context of that they need to follow the same rules. Charters are the distinct dividing line on the board and also because my daughters are in special education it’s also a passion of mine. Q: How do you feel like you can beat Mónica García? A: When I started to get out there and speak to the community, I found the support for her is not as strong as it’s made out to be. She has been on the board for 10 years. People start to see the differences they have with her. In particular, the ones with co-location schools, they don’t feel like they have been given an even shake and she just gives the charter schools what they want and their schools have been shortchanged. It’s going to be an uphill battle. I know it. Q: You don’t speak Spanish, you’re not Latino. A: I don’t speak Spanish. I am being outspent. To get out there and at least having the debate is the most important thing. I know it’s heavily Latino, but it also encompasses Koreatown and Little Tokyo and that is a huge constituency that has been avoided. I would have my staff reflect the neighborhood I represent. I know how to listen to people and I have shown I can work with all different groups. Q: The last time you ran, it was in an area you lived in for a while in the San Fernando Valley. Are you and your family actually moving now to East Los Angeles? A: Yes, I’m renting a room for the school year and living there. We will be moving, but I wanted to be the least disruptive to the kids during the school year, so it wasn’t possible to move everyone. Q: So your whole family will be moving? A: Basically we are separating for now. Up until the last second, my wife had veto power, but she decided this was important too. It was a very tough decision. Q: Some people would say you are being a carpetbagger, moving into the district specifically to run for it. A: I’ll face that head on. I moved into that district to run. My wife’s uncle said, “Wait, you’re moving to our old neighborhood.” They all moved out of the area since then, but they used to live there. Q: What do you like about District 2? A: I feel like I understand the things that affect them. I feel like in the last race I took some unpopular positions for the Valley. Tamar Galatzan was very big about attacking Title 1 schools and the harm they were doing to the Valley, and I would call her out on that. These are the schools she was talking about. That’s my connection, and I feel like I understand the issues that are facing those schools. Q: Will you still be moving if you lose the primary? A: If I do not get in the runoff we will still move to that district, we are moving out of Northridge. My wife works in Koreatown and I work in Glendale, so the area is correct for us. Q: Do you feel like you are following all the election rules? A: I’m going there at night, I’m registered there, I voted there in the November elections. I really like taking the public transportation, I walk a mile to the station and smell the bakeries and pass the family shops. It’s definitely different in a good way. Q: What did you learn from running against Galatzan that will help you this time around? A: I was successful against Tamar, there were five opponents and three of us had agreements together and we made sure there was a run-off. After the primary, I supported Scott (Schmerelson) and said: “I will work for you as much as I would work for me.” I supported him right after the primary and was there right through election day. I gave a public endorsement, I walked doors for him, I made phone calls. Q: What was your biggest problem with Galatzan? A: I really felt that Tamar was hurting the district. I think that her loyalties were to the charter schools. And whatever your feelings on charter schools, a board member’s responsibilities are actually to run the district schools. I think we see it now with Monica and how there was a charter school just up for renewal, and the charter division was against the renewal, and it is rated by the charter school association as a 1 out of 10 and still she persuaded the board to keep it open. That is a loyalty that is misplaced. Q: What are your top issues? A: Top of my list right now is that none of the board members that are sitting have a child enrolled in the school district, and I think that is an important voice that is missing. Second, I want to bring accountability to charter schools. I support the NAACP’s call for a moratorium until we can improve the governance of these schools. Also, we have to respect all of our students. Right now the big push seems to be that all of our kids are college ready. But all of our kids aren’t going to college. We need to reinvigorate our vocational training and help those kids meet their full potential. Q: Of course you speak from experience. A: Yes, my two daughters are on a spectrum and are never going to be completely independent, but we can get them as far as they can go. We have to focus on all kids. In that category, art and music are big also. We have to move beyond what is tested and get kids interested. Q: Were you a good student? A: I was a horrible high school student, but band class got me through the day. I was a drummer in a marching band in upstate New York. Q: Are you for breaking up this district? A: Done correctly, I think it may be the only way to save it. The bureaucracy is just so huge. Q: What do you see as solutions to looming budget issues? A: First to start, we have to stop throwing away students. We are just bleeding students to charters. We shouldn’t be reauthorizing ones that aren’t doing better. The whole reason for charter schools was to do experiments in making education better. By allowing them to continue is defeating the whole purpose. A: We have to look at how charter schools are enrolling students. LAUSD has a bigger percentage of special education, a bigger percentage of English learners and ones with more behavior problems. So not only are we losing students, but the ones we are keeping are more expensive to educate, so we have to make sure things are being done equitably. Q: Will you ever run for a school board seat again if you lose this one? A: If I say yes, my wife might kill me. I will still have to be involved in education in some ways like I was after the last race, investigating things, writing about things. I don’t think I would run again, this is potentially my last run for public office. Q: What would you tell someone about why you are running? A: I’m running first and foremost as a Dad. I feel like a lot of times this district is just union and charters and it leaves a lot of people in the middle. Both sides say they represent parents. The laws are written so that parents have choice, and if the district is going to avoid bankruptcy, they will have to start listening to parents.